Before the opera began a representative of Bayerische Staatsoper gave a tribute from the stage to the much-admired German bass Kurt Moll who recently died aged seventy-eight. Despite all the controversy over the years about Mozart’s singspiel Die Entführung aus dem Serail (The Abduction from the Seraglio), with its libretto set in Turkey, it’s a compelling work that deserves to be performed far more than it currently is. 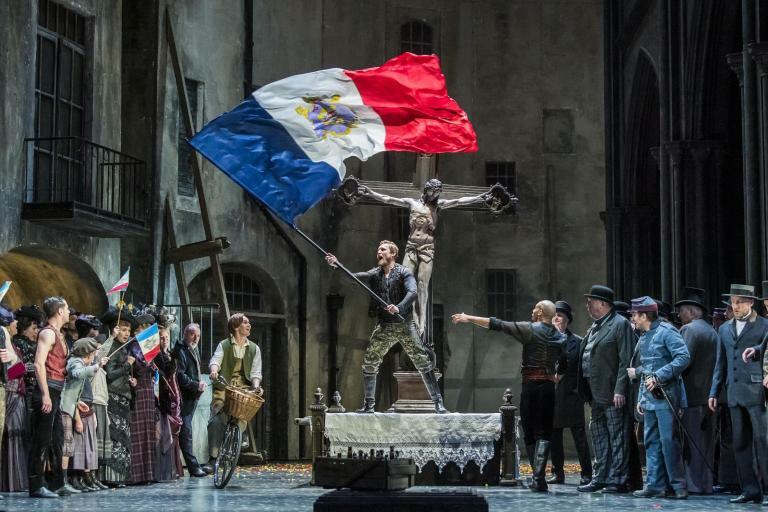 When this Martin Duncan production was first given by the Bayerische Staatsoper in 2003 there was controversy generated mainly about the portrayal of Muslim women but now for this revival the hullabaloo seems to have died down and I’m glad the company persevered with this amusing production. My sense was the packed Nationaltheater audience was delighted with both staging and performance of this often-overlooked masterpiece. This was my first live production of Die Entführung so I was unable to compare this boldly colourful staging, a creative collaboration between director Martin Duncan and his designer Ultz, to any more traditional staging. However, I have seen several DVD/Blu-rays including most recently David McVicar’s 2015 staging at Glyndebourne on Opus Arte. On this Munich reporting trip I have attended four orchestral concerts and three opera performances and it is Die Entführung that still resonates in my head; it certainly made a significant impression. A masterstroke was Duncan’s treatment of the opera’s libretto containing considerable and off-putting recitative which was condensed and communicated at various points most successfully by rich, dark toned narrator Charlotte Schwab; dressed in a black burqa. Most striking in the set of the seraglio were the six large vibrantly coloured settees suspended by wires to overheard runners that were regularly moved to and fro across the stage. There was some noise produced by this operation but nothing much to worry about. These settees usually accommodated a principal or member of the harem. Once I got past what I initially thought was a ridiculous idea of the moving settees I was able to concentrate on enjoying this colourful spectacle. Some twenty-five or so of the women cast were dressed in black burqas with face veils and the harem at the seraglio wore a colourful and skimpy take on traditional Turkish garments with face veils. A rather contrived action to raise a laugh was at the commencement of the opera ten of the male cast marched onto the stage and dropped their trousers revealing a black cross on the front of their underwear signifying they were eunuchs. Making the most of her role was the raven haired Spanish lady Konstanze sung by Lisette Oropesa notable for her creamy tone. Extremely well focused she projected her voice strongly through the house right from her first aria ‘Ach ich liebte’ and I especially admired her heavenly aria ‘Martern aller Arten’ from Act II. It was pleasing seeing Daniel Behle grow into the role of Spanish nobleman Belmonte. His attractive tone and technically secure voice are his main attributes and his acting confidence increased markedly singing delightfully Belmonte’s aria ‘Wenn der Freude Tränen fliessen’ from Act II. Sofia Fomina as Blonde, Konstanze’s English maid displayed her bright attractive voice, firmly projected and achieved her high notes relatively easily as demonstrated perfectly by her Act II aria ‘Welche Wonne, welche Lust’. Enthusiastic Matthew Grills tried his level best as Pedrillo although limited by his vocal attributes which seemed rather moderate on the night. He coped reasonably well with his Act II ‘Frisch zum Kampfe’ where he promises how in the future he will be bold and daring and also the Act III charming serenade ‘In Mohrenland’ his signal to the women to escape to freedom. Looking very much the part of harem overseer Osmin, Peter Rose excelled with his humour and stage presence. Singing admirably and with feeling the unruffled Rose was especially striking in his challenging early aria ‘O wie will ich triumphieren’. As Pasha Selim with the single spoken line Bernd Schmidt certainly looked the part decked out in colourful clothes styled on the Ottoman Empire, notably yellow turban and green coat embellished with yellow discs. Under Constantin Trinks the Bayerisches Staatsorchester played with a real affection for the score and was in fine form displaying its usual sense of spirit and refinement. There were one or two rather curious aspects to the production. Oddly the formally dressed male chorus had been positioned at both ends of the orchestra pit and what was the point of a group of boisterous young men wearing replica Turkey football shirts and national flags? Generally, the audience seemed to enjoy seeing the eunuchs walking around with tables on their heads holding bowls of fruit. The diction of the principals was fine nevertheless I’m not sure why German surtitles were absent, not to mention an English translation, to help widen the international reach of the Bayerische Staatsoper.